"Use caution during outdoor Father's Day activities! Expecting uncomfortable weather. Hot temperatures plus humidity will make it feel like 95-105°. 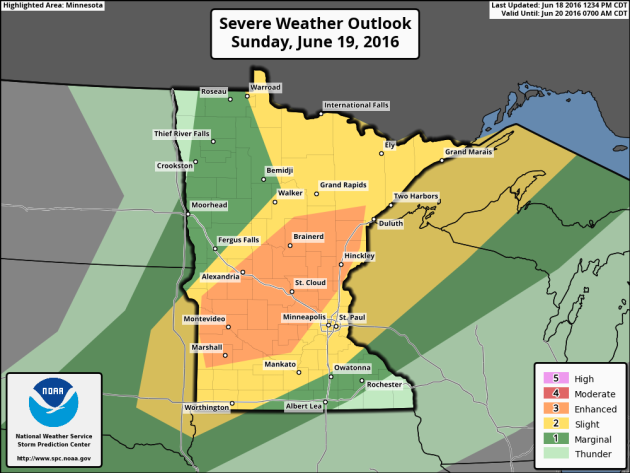 Sunday afternoon enhanced risk for widespread thunderstorms. When thunder roars, go indoors!" WOW! Thanks to Rien Schlecht for this incredible rainbow picture! She said it was the most vibrant one she's ever seen! Looks pretty spectacular Rien! Thank you for sharing. 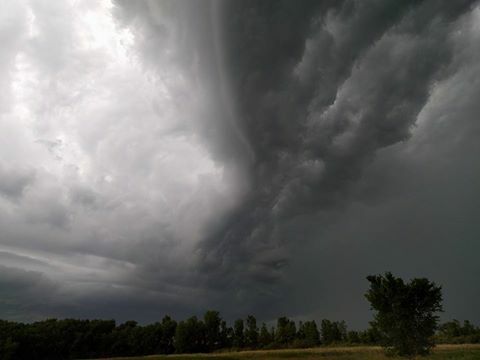 Thanks to Michael Stanga for this neat picture from near Kingston, MN Friday evening. This was from the same group of storms that started in eastern ND on Thursday and pushed into NW Minnesota Friday morning and eventually into SW Minnesota by Friday evening. 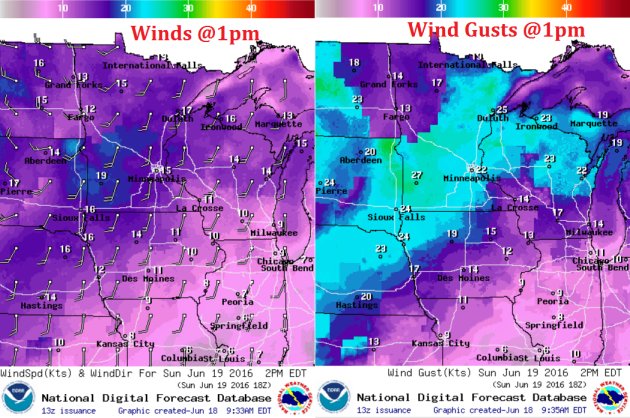 ...HOT AND HUMID WEATHER SUNDAY... .A SEASONABLY WARM AIRMASS WILL MOVE ACROSS THE REGION AND BRING HEAT INDICES OF 95 TO 105 DEGREES ACROSS WESTERN AND CENTRAL MN. ...HEAT ADVISORY IN EFFECT FROM 1 PM TO 8 PM CDT SUNDAY... 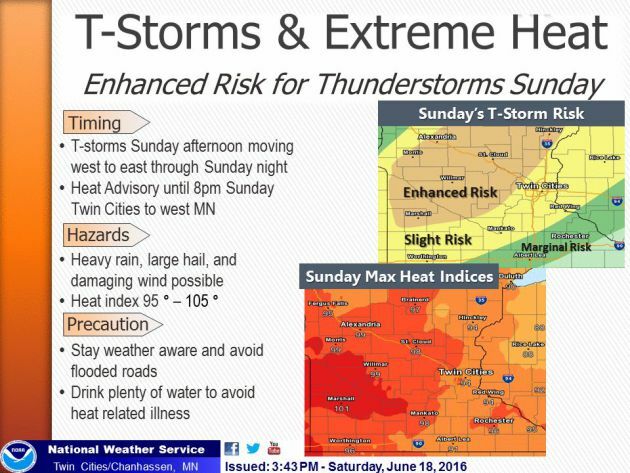 THE NATIONAL WEATHER SERVICE IN TWIN CITIES/CHANHASSEN HAS ISSUED A HEAT ADVISORY...WHICH IS IN EFFECT FROM 1 PM TO 8 PM CDT SUNDAY. * TEMPERATURE...AIR TEMPERATURES 90 TO 95. HEAT INDICES 95 TO 105. * IMPACTS...HEAT RELATED ILLNESS IS POSSIBLE IF PRECAUTIONS ARE NOT TAKEN. During extremely hot and humid weather, your body's ability to cool itself is challenged. 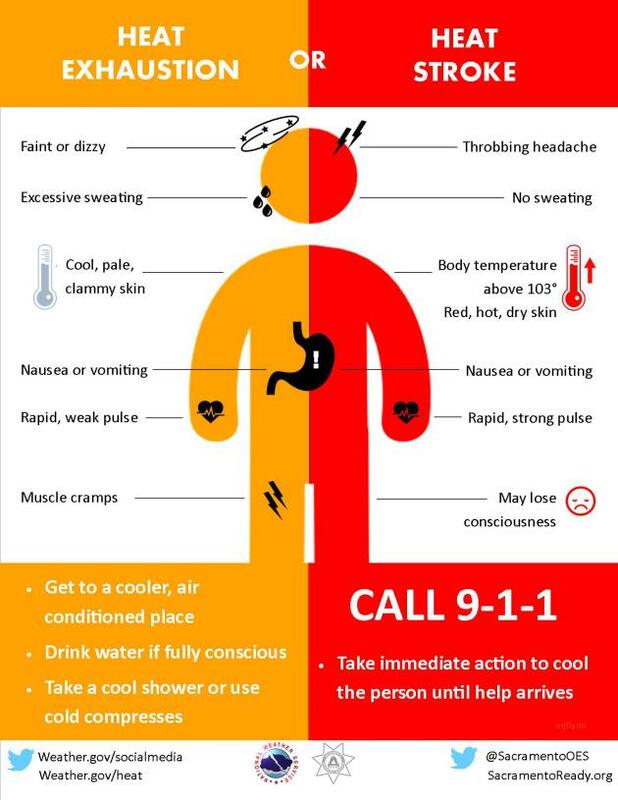 When the body heats too rapidly to cool itself properly, or when too much fluid or salt is lost through dehydration or sweating, body temperature rises and you or someone you care about may experience a heat-related illness. It is important to know the symptoms of excessive heat exposure and the appropriate responses. The Centers for Disease Control and Prevention provides a list of warning signs and symptoms of heat illness, and recommended first aid steps. 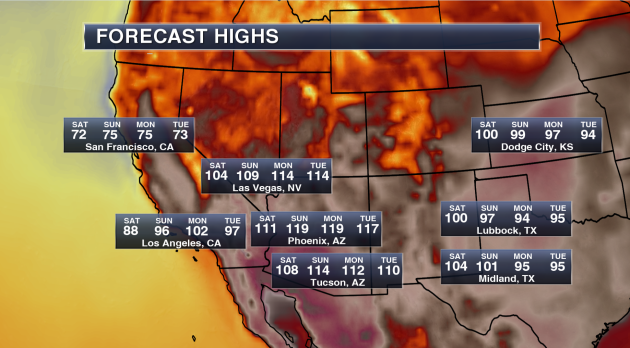 The dome of hot weather will continue to build across the Southwestern part of the nation with some spots nearing all-time record highs Sunday and Monday. 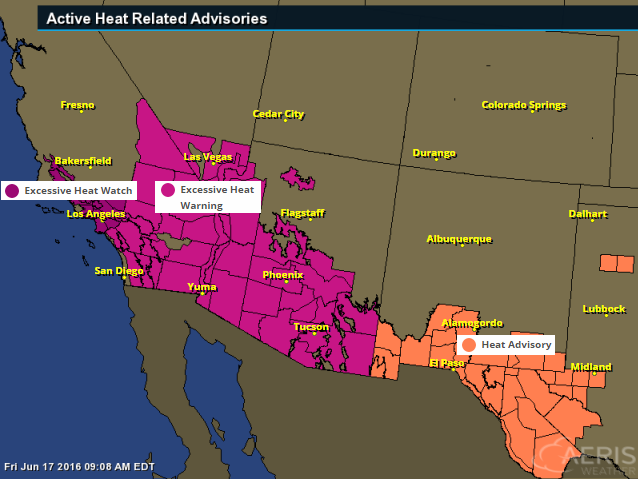 The National Weather Service has issued a number of excessive heat watches and warnings across the Southwest, which includes major cities like Los Angeles, Las Vegas, Phoenix, Tucson and Yuma. - Highs will approach 120 on both Sunday and Monday. Phoenix has only had a high of 120 or higher three times in their recorded history (since 1895). - The last time Phoenix hit 120 or higher was back on July 28, 1995 when the thermometer hit 121. - Whether the temperature touches 120 or not, record highs are likely. The current record high each day between Saturday and Tuesday is 115. - We are calling for a forecast high of 114 on Sunday. Only seven times in Tucson recorded history (since 1894) has the city seen a high of 114 or higher – the last time occurring on July 28, 1995 when it also reached 114. - The all-time record in Tucson history is 117 set back on June 26, 1990. - Record highs over the weekend and into next week are 113 Saturday, 112 Sunday, 110 Monday and 112 Tuesday. - Las Vegas is no stranger this type of higher heat in the forecast, reaching a temperature of 115 or higher 55 times since 1937. The last time Las Vegas saw a high of 115 or higher was back on July 2, 2013. - The warmest high ever in Las Vegas history is 117 reached three times in their history. The most recent occurrence was back on June 30, 2013. - Our forecast has Las Vegas reaching 114 both Monday and Tuesday next week. - Record highs this weekend into next week are 115 Saturday, 114 Sunday, 113 Monday and 111 Tuesday. - Even Los Angeles will get in on the heat this week into early next week, reaching at least the mid 90s Sunday through Tuesday. - We could even see highs in downtown Los Angeles break the triple-digit mark next Monday. Down toward LAX, highs Monday will be near 90, which could break the record for the day of 86. Here's a look at rainfall from AM June 13th to AM June 18th. Note that there were several locations that saw 1" to 2"+ amounts with some spots even seeing 3" to 4"+. Here's an excerpt from Mark Seeley's Weather Talk on the heavy rains last week. The warm and humid conditions of last weekend help set the stage for numerous thunderstorms this week across much of the state. Recall that the weather of last weekend produced widespread readings in the 90s F around the state, including a record high of 98°F at Winnebago on the 11th, and a record high of 96°F at Lake Wilson on the same date. Many observers also reported near record dew points in the 70s F, leading to Heat Index readings over 100°F in many places. This represents a large quantity of water vapor which does not allow the air to cool off much at night. As a result, Tracy set a new record warm minimum temperature on the 10th, with a reading of 73°F. All of the water vapor in the atmosphere served as fuel for thunderstorms, which became widespread across the state over June 11-14. Over those 4 days many areas received from 2-4 inches of rain. A few highly localized amounts were even greater causing some short-lived flooding concerns. You can read more about the distribution of these storms at the Minnesota StateClimatology Office web site. Some climate stations reported new daily rainfall records as a result of these thunderstorms. These included: on the 11th Lake City 2.03 inches; on the 12th Thorhult 1.70 inches; on the 13th Eveleth 2.51", Dassel 3.19", Embarrass 1.96", and Stillwater 1.54"; on the 14th Amboy 2.00"; and on June 15th record values were reported for La Crescent 1.78", Melrose 1.80", Caledonia 1.51", Harmony 2.07", Houston 2.83", Waseca 3.19", and Forest Lake 2.00". The strong thunderstorms on June 14th produced tornadoes in Pipestone, Traverse, Big Stone, Le Sueur, and Blue Earth Counties. All were relatively short-lived and produced relatively little damage. Very strong winds up to 60mph were also reported from portions of Nobles, Jackson, Cottonwood, Brown, and Watonwan Counties. As a result of the rainy week, many climate stations are already reporting total monthly rainfall that exceeds the June normal. This continues a recent climate trend for June, as 15 of the most recent Junes have been normal or wetter than normal on a statewide basis. SHEAR WILL BECOME VERY SUPPORTIVE OF SUPERCELLS -- AND THUS A FEW INTENSE CELLS CAPABLE OF PRODUCING VERY LARGE HAIL AND LOCALLY DAMAGING WINDS ARE EXPECTED TO EVOLVE BY LATE AFTERNOON/EARLY EVENING. I have good memories about my late father today. He always enjoyed sitting in a lawn chair on a hot summer day listening to John Gordon call a Twins game on the radio. I miss you pops! Heat advisories have been posted across parts of southern Minnesota today for heat index values or feels like temperatures that could near 100 degrees. Today offers a free trip to the Minnesota sauna. 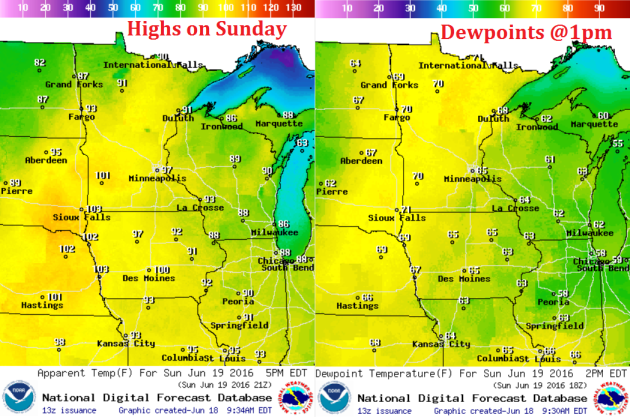 Temps in the 90s combined with a tropical dewpoint near 70 degrees, will have your dripping in your Sunday best. However, there may be a little relief as a breeze from the southwest wind blows at 10 to 20mph. An approaching cool front could make for a potentially bumpy later afternoon/evening as strong to severe storms develop. Have a plan 'B' ready if skies look threatening later today. SUNDAY NIGHT: Showers and storms early, (some severe?)? Winds: SSW 10-25. Low: 62. THURSDAY: Spotty PM thunder. Winds: NW 5-10. Wake-up: 63. High: 82. SATURDAY: Average for June. Stray PM thundershower. Winds:SE 5-10. Wake-up: 64. High: 81. 2014: Heavy rain leads to widespread flooding in the Twin Cities metro area. Minnehaha Creek has its record crest of 17.64 feet on this date. Eden Prairie records 5.47 inches of rain, while MSP airport receives 4.13 inches, the highest daily total in 5 years. 1955: Hailstones the size of hen's eggs fall in Roseau County. A brief stint of sticky, hot summer weather will be with us through the weekend, but we cool down back to near normal levels again early next week. 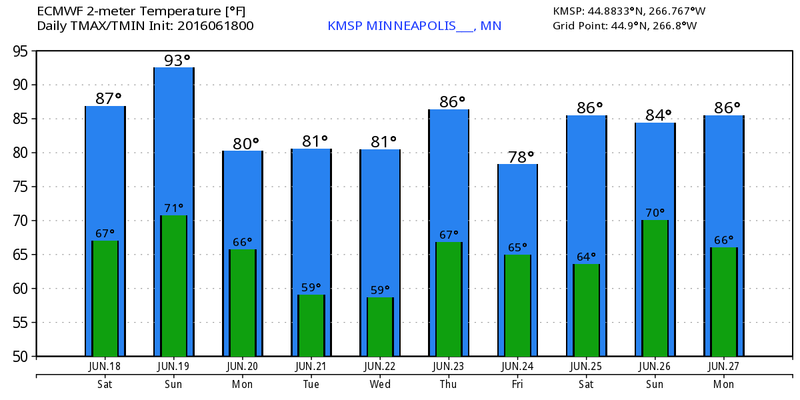 The extended forecast at this point doesn't show any major heat moving back in through the next 10 days. According to NOAA's CPC, the 6 to 10 day temperature outlook suggests above average temperatures returning to the Midwest from June 24th - 28th. However, the warmest weather looks to stay west of us. 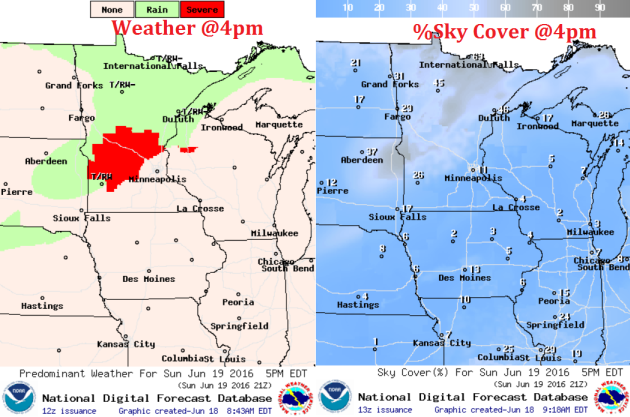 Sunday will be a VERY warm and humid day with high temperatures across much of the state in the 90s with a few locations in SW Minnesota nearing 100F! The other factor will be high dewpoints in the upper 60s to low 70s, which will bring feels like temps or heat index values to near 100F. Not only will Sunday be a hot and sticky day, but it'll also be breezy! Gusty SSW winds will be up around 10-20mph with gusts approaching 25mph+ at times ahead of a cool front expected to move through the region late in the day. This front looks to kick up showers and storms in the late afternoon/evening hours, some of which could be strong to severe. Here's a look at the weather at 4pm Sunday. Note the red colors showing up in Central MN, this indicates the potential of strong to severe storms. Hail and high wind look to be the primary threat along with heavy pockets of rain... stay tuned and keep an eye/ear on weather forecasts later in the day. The simulated radar through PM Monday suggests a line of storms popping Sunday across the state on Sunday afternoon/evening. Keep in mind that some of these storms could be strong to severe. 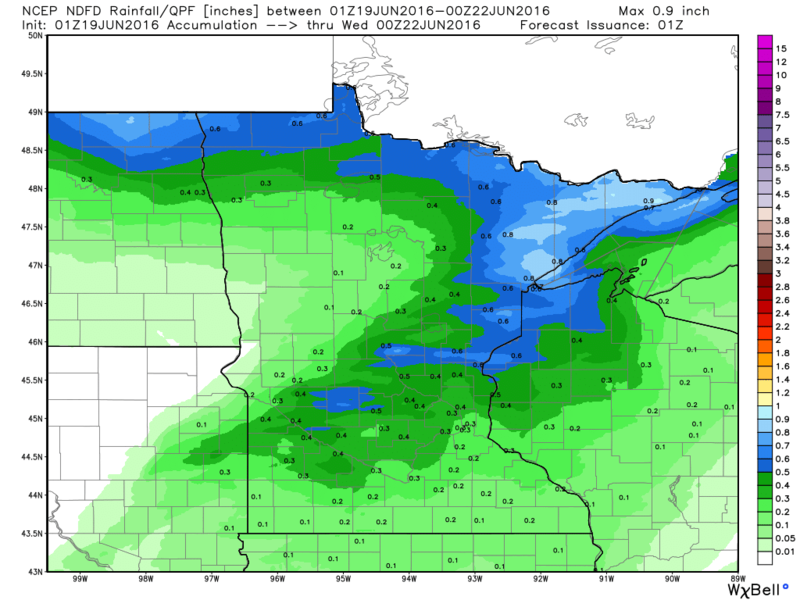 Rainfall potential through AM Tuesday suggests heavier rainfall across parts of central and northern MN. This heavier rainfall potential will be associated with scattered showers and storms that will be develop late Sunday afternoon/evening. A storm system moving into the Western U.S. that brought snow to parts of the northern Sierra Nevada range will wash out a bit through early weekend. 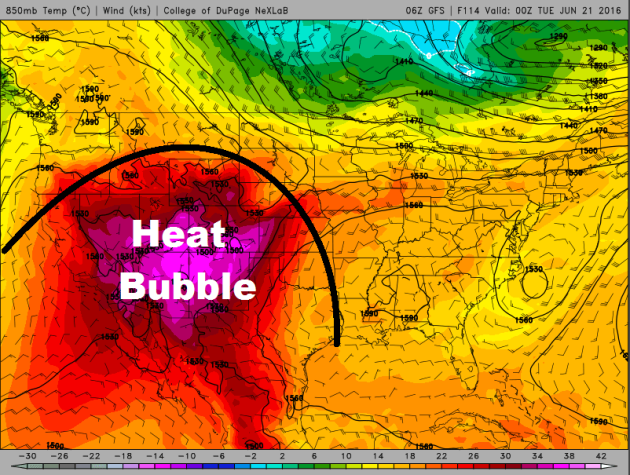 As this happens, dangerous heat begins develop in the Southwest through early next week. Meanwhile, scattered showers and storms will be possible across parts of the Midwest through the early weekend. ...SUMMARY... SCATTERED SEVERE STORMS ARE POSSIBLE SUNDAY FROM EASTERN SOUTH DAKOTA ACROSS MUCH OF MINNESOTA AND INTO NORTHWEST WISCONSIN WITH HAIL AND WIND EXPECTED. ...SYNOPSIS... BROAD/FLAT RIDGING ALOFT SHOULD PREVAIL ACROSS MOST OF THE U.S. DAY 2/SUNDAY...WITH LOWS/TROUGHS LINGERING OFF BOTH THE W AND E COASTS AND FAST/WLY FLOW AT MID AND UPPER LEVELS CONFINED TO THE NRN U.S. AND ADJACENT SRN CANADA. A FAST-MOVING SHORT-WAVE TROUGH -- WITHIN THE AFOREMENTIONED WLY FLOW FIELD -- IS PROGGED TO SKIRT THE U.S./CANADA BORDER REGION...MOVING QUICKLY EWD FROM MT EARLY IN THE PERIOD TO THE UPPER GREAT LAKES REGION/WRN ONTARIO LATE. AT THE SURFACE...A COLD FRONT INITIALLY PROGGED TO EXTEND FROM A LOW INVOF NERN ND/NWRN MN/SERN MANITOBA SWWD ACROSS THE DAKOTAS AND INTO THE INTERIOR WRN U.S. IS FORECAST TO MAKE STEADY EWD PROGRESS ACROSS THE N CENTRAL CONUS. BY THE END OF THE PERIOD...THE FRONT SHOULD EXTEND FROM THE WRN UPPER GREAT LAKES REGION SWWD ACROSS THE UPPER MIDWEST/MID MO VALLEY AND THEN WWD INTO THE CENTRAL HIGH PLAINS. THIS FRONT WILL FOCUS THE PRIMARY ZONE OF SEVERE RISK THIS PERIOD. ...WRN UPPER GREAT LAKES/UPPER MS VALLEY REGION SWWD TO ERN SD/NWRN IA... AN OVERNIGHT/ONGOING MCS INVOF THE INTERNATIONAL BORDER -- I.E. PARTS OF ERN ND AND NWRN MN -- MAY BE ONGOING AT THE START OF THE PERIOD...WHICH COULD POSE LINGERING SEVERE RISK /HAIL AND/OR DAMAGING WINDS/ ACROSS PARTS OF THIS AREA. EXPECT THIS ACTIVITY TO DIMINISH WITH SWD EXTENT THROUGH THE MORNING...PRIMARILY AFFECTING SWRN ONTARIO. MEANWHILE...NEW/AFTERNOON THUNDERSTORM DEVELOPMENT IS FORECAST TO OCCUR ACROSS MN/ERN SD INVOF THE ESEWD-MOVING COLD FRONT...AS STEEP LAPSE RATES ALOFT COMBINE WITH A MOIST/HEATING BOUNDARY LAYER TO YIELD MODERATE TO STRONG INSTABILITY /3000 TO 4000 J/KG MIXED-LAYER CAPE/. CAPPING SHOULD HINDER DEVELOPMENT UNTIL MID AFTERNOON ACROSS THIS AREA...AND SHOULD MORE SUBSTANTIALLY LIMIT PROSPECTS FOR ANY MORE THAN ISOLATED STORMS WITH SWWD EXTENT ALONG THE FRONT INTO THE NEB VICINITY. AS THE UPPER TROUGH TRAVERSING THE INTERNATIONAL BORDER ADVANCES...STRONG MID-LEVEL FLOW /50 TO 60 KT/ SHOULD OVERSPREAD CENTRAL AND NRN MN DURING THE AFTERNOON. ATOP BOUNDARY-LAYER SSWLY WINDS IN THE WARM SECTOR...SHEAR WILL BECOME VERY SUPPORTIVE OF SUPERCELLS -- AND THUS A FEW INTENSE CELLS CAPABLE OF PRODUCING VERY LARGE HAIL AND LOCALLY DAMAGING WINDS ARE EXPECTED TO EVOLVE BY LATE AFTERNOON/EARLY EVENING. WITH THE LOSS OF DIURNAL HEATING/BOUNDARY-LAYER STABILIZATION AS THE EVENING WEARS ON...SEVERE RISK SHOULD GRADUALLY DIMINISH AS STORMS SPREAD EWD INTO THE UPPER GREAT LAKES REGION. ...SUMMARY... ISOLATED MARGINALLY SEVERE THUNDERSTORMS CAPABLE OF WIND AND HAIL ARE POSSIBLE ON MONDAY FROM EASTERN IOWA ACROSS THE LOWER GREAT LAKES REGION. ...SYNOPSIS... A LARGE AREA OF LOW PRESSURE WILL DEEPEN OVER WRN QUEBEC DURING THE DAY WITH A COLD FRONT DRAPED W-E FROM THE UPPER MS VALLEY EWD ACROSS THE LOWER GREAT LAKES AREA. AHEAD OF THIS FRONT...A WARM AND MOIST AIR MASS WILL EXIST...RESULTING IN MODEST LEVELS OF INSTABILITY. ALOFT...AN INTENSE SHORTWAVE TROUGH AND CYCLONICALLY-CURVED MIDLEVEL JET WILL DIVE SEWD ACROSS THE UPPER MS VALLEY AND INTO THE GREAT LAKES...WITH MOST OF THE STRONGER FLOW BEHIND THE SFC FRONT. ...ERN IA...NRN IL/IN/OH...SRN LOWER MI...NWRN PA AND WRN AND NRN NY... SPORADIC SHOWERS AND STORMS ARE EXPECTED TO BE ONGOING IN ASSOCIATION WITH THE COLD FRONT MONDAY MORNING FROM NEBRASKA EWD ACROSS IA...WI AND MI...WITH PERHAPS SOME MARGINALLY SEVERE WIND GUSTS WITH ANY ONGOING LINES OF STORMS. LATER IN THE DAY...STRONG HEATING WILL OCCUR AHEAD OF THE COLD FRONT AND AID IN REDEVELOPMENT. SINCE THE AREA IS S OF THE UPPER JET...THERE MAY BE SOME SUBSIDENCE ALOFT AS INDICATED IN FORECAST SOUNDINGS WITH WARM LAYERS IN THE MIDLEVELS. IN ADDITION...SHEAR WILL NOT BE PARTICULARLY STRONG...BUT MAY SUPPORT MARGINALLY SEVERE STORMS ESPECIALLY ACROSS THE LAKE ERIE/ONTARIO AREA CLOSER TO THE STRONGER FLOW ALOFT. May, on average, sees the most tornadoes out of any other month across the nation, averaging 276. Here's a look at the severe weather numbers across the nation for May 2016, which saw 239 tornado reports. While May, on average, sees the most tornadoes across the nation, June is typically the most active tornado month is Minnesota, averaging 18. Interestingly, The yearly average tornado count is 45. According to NOAA's SPC, there have been 10 tornadoes in Minnesota so far this month, most of which happened on Tuesday, June 14th. According to NOAA'S WPC, the 5 day rainfall forecast suggests heavier pockets of rain across parts of the northern tier of the nation through the Mid-Atlantic states and into the Southeastern U.S.. Keep in mind that with thunderstorm activity, some locations could see 1" to 2"+ through the end of the weekend. "Growing Up With Climate Change"
"﻿My generation will be the first to have lived an entire lifetime in a climate changed world. 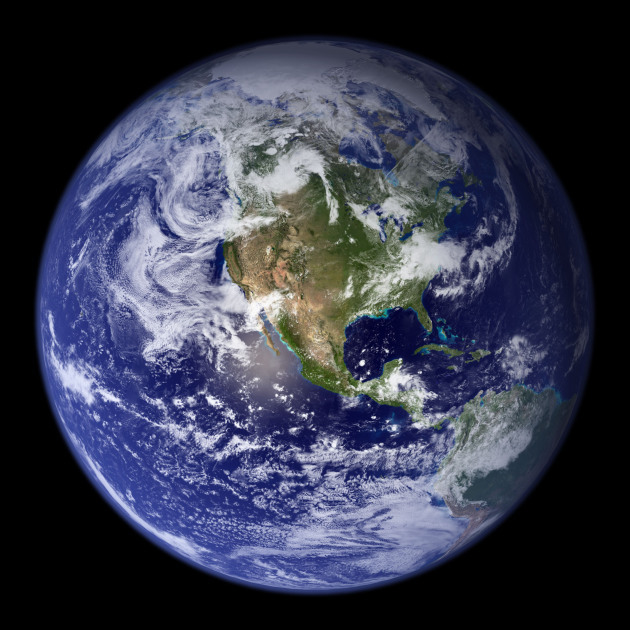 We witnessed the first climate impacts. We will experience the worst. We were born into this crisis and did nothing to cause it. Everything that we know and love—from our backyards to the existence of Planet Earth—is threatened. This is a generation unlike any other. What is it like to grow up with this new climate reality? I spoke to six young people who have been working on climate change from a young age and know what it’s like to grow up with this crisis. Their ages range from 13 to 29. Each confronts a different face of the crisis, from the coal mines of West Virginia to the drought-stricken plains of Kenya. Their words offer a glimpse into the challenges, heartaches, opportunities, and hope of growing up with climate change. There is one key theme that unites these young people: the commitment to self-determination. Each has crisis thrust upon them. They know that climate change will inevitably impact their futures, homes, families, communities. There is a sense of doom, of unavoidable catastrophe. They could be passive victims, absorbing the consequences of a warmed world. They could allow climate change to dictate their destiny." 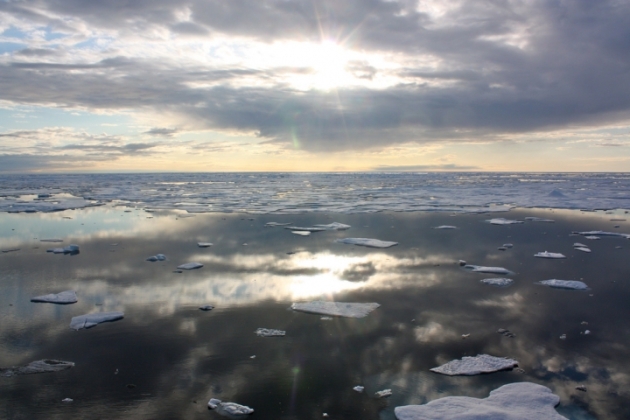 "Scientists Urge Obama to Halt Oil Leasing in the Arctic"
"IBM's Deep Thunder Shows How Weather is Big Business "
"IBM Research and The Weather Company are putting forecasting models and machine learning to work on historical data. The result? 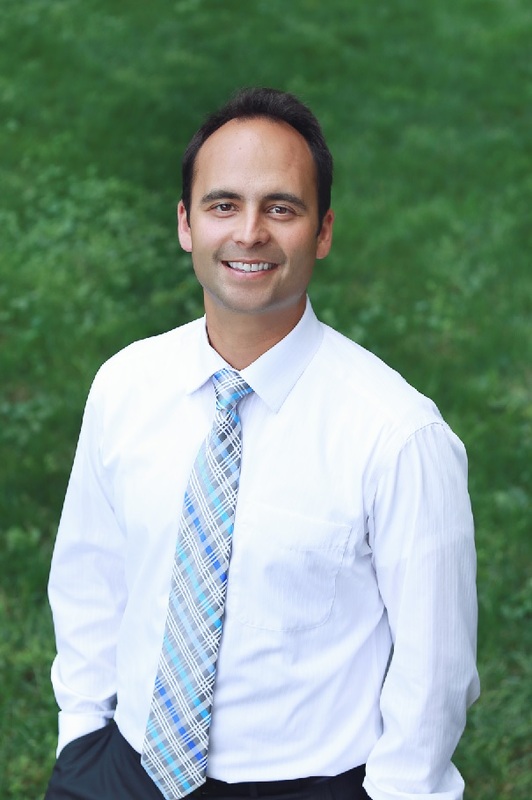 Deep Thunder, a hyper-local forecasting tool offering precision insights and predictions for business customers. The Weather Company, which is now a part of IBM, has a new commercial offering called Deep Thunder, announced this week. Deep Thunder combines hyperlocal, short-term custom forecasts developed by IBM Research with The Weather Company's existing global forecast model. Deep Thunder will use historical weather data to train machine learning models to help businesses predict the actual impact of weather, IBM said in a statement released June 15. The name Deep Thunder had already been in use by a team within IBM. 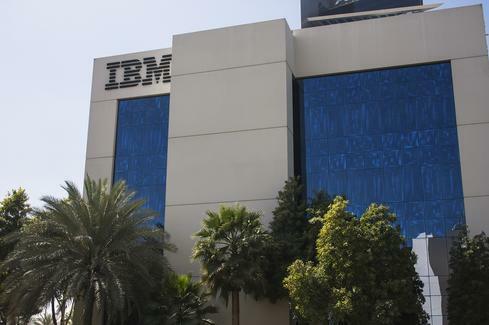 This new commercial offering, however, marks the first time IBM has used Deep Thunder as a brand name, and the first time The Weather Company's capabilities have been combined into the project."